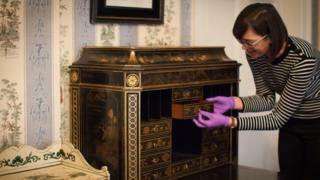 Delicate removal work has begun to relocate treasures made by Leeds-born Thomas Chippendale for an exhibition marking 300 years since his birth. Among the furniture which has been moved from the city's Temple Newsam House is a lady's secretaire made in 1773, for which he was paid £10,000. The piece was saved in 1999 after a ban prevented it from being sold to a person in New York. The exhibition will feature work which has never been displayed in public. Born in Otley, Leeds in 1718, Chippendale was the only child of John Chippendale, a joiner, and Mary, whose father was a stonemason. He probably received training as a joiner and carpenter in the family workshop and was educated at Otley Grammar School. By the 1740s he was almost certainly working in York as a cabinet maker before making his name in London, working in some of the greatest houses in the country. Outside his work, he fathered 12 children and had two marriages before his death in 1779. Correspondence in the exhibition reveals some of his financial difficulties and despite the high value of his work he never made his fortune. The inventory of his property after his death showed his possessions were valued at less than £30. Originally made for the state bedroom at Harewood House, the secretaire cost £26 when it was created and was part of Chippendale's 30-year commission at the estate. Other key pieces will include loans from the Royal Collection, Paxton House, Newby Hall and Dumfries House. Image caption Chippendale wrote about his figure of a crane, stating it was "the emblem of care and watchfulness"
Objects from his early life alongside hand-drawn designs and some of his best work will also be on show at the Leeds Museum exhibition from 9 February. Museums, charities, and other organisations across the country are taking part in a year-long programme of events to mark the 300 year anniversary of his birth in June 1718.